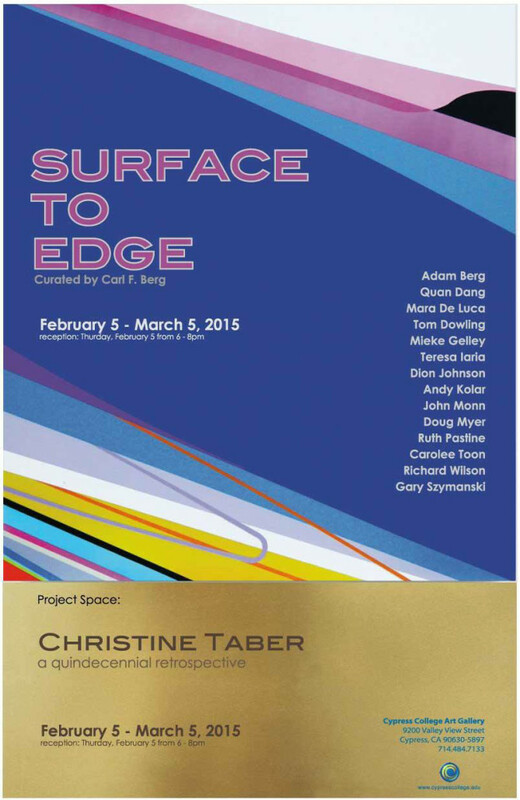 Opening reception February 5, 7–9 p.m.
Color field and hard edge painting are two divergent butrelated spheres of abstraction. Bothfocusing on color and sometimes the interplay plays of colors these twodeviating forms of abstraction come together to explore the relationship ofcolor to the viewer. Optical phenomenon is at play creating illusion throughthe use of color and form. Edge to Air exploresthe work of 15 artists who use of color that is inspired by a range a diverseranges of sources and concepts. Adam Berg, a Los Angeles-based artist, received his PhD in Philosophy, University of Haifa, Israel in 2008and also studied art and architecture in Italy and Canada. Berg has a diversepractice that employs a wide range of methods all of which arefused through an interplay of images, codes and imaginary transformations. Berg explores color through reflectioncapturing the images fromits surroundings on the multifaceted reflective highly polished stainless steelsurfaces. Quan Dang was born in Saigon, Vietnam and currently lives insouthern California where hereceived aBFA in Painting & Drawing Otis College of Art and Design in 2004. Dang is a multidisciplinary artist whosepaintings are inspired by advertisements and product design. They reflect thecarefully chosen colors that inspire the viewer to respond though an intenseinterplay of color and form. Mara De Luca was originally east Coast based, whereshe received a BA from Columbia University, Department of Visual Arts, New York. Shortly after De Luca moved to Berlin thencame to southern California to attend Cal Art where she received her MFA in2004. De Luca’s artwork in painting is a reflection on contemporary cultureexpressed though a diverse and project-driven approach to the medium. Whetherthrough an exploration of historical conventions or by way of mimickingcontemporary digital imaging tropes, she employs and exploit the complex rangeof the medium: its diverse genres and theoretical constructs as well asmaterial, process and craft. Tom Dowling is a southernCalifornia-based artist whose work of the last 30 years has a personal thread that weaves ittogether into a fabric that take both of the “High” and “Low” in art. Dowlingreceived his MFA from UC Irvine where he studied under many wonderful artistsincluding his mentor Tony DeLap. In his most recent paintings Dowling’s artworks are deliberatelypared down to their basic elements, resulting in impeccable design that bridgesreductive aspects of modern art with the simplification and “form followsfunction” aspects of modern architecture. MiekeGelley is a southern California-based artist who is originally from TheNetherlands. She studied at the Royal Academy of Fine Arts in The Hague whereshe received her MFA. Her work shows affinities to “post-minimalism” in forms, geometries,even some of the deadpan iconic shapes of late modernism, but without thescale, self-seriousness and grand thematic reach that is often embodied in thatwork. Her artwork offers a reducedpallet in which color and field play an important role although with much moresubtlety than other painters in the exhibition. TeresaIaria is an Italian-based artist whose work focuses on theinteraction between different languages and their codes. She will present bothvideo and sculpture-based works that interpret the core for the potentialunfolding of images as sort of color cryptograms that are visualized asabstract concrete and atmospheric forms. DionJohnson is originally from Ohio and moved to Los Angeles to attendClaremont Graduate University where he received his MFA in 2000. Johnson’s paintings combine and explore dynamic opposites:expansiveness and compression, darkness and light. His abstract works usescolor to evoke the contemporary urban, digital and natural landscape ofSouthern California, and skews the vocabulary of abstraction into a hybridtechno-language. Andy Kolar, LosAngeles-based, move from Iowa to attend Cal State Long Beach where he receivedhis MFA in 2007. Kolar’s abstract painting and sculptures is intentionallypositioned between representation and abstraction, a place where the simplifiedshapes are approaching abstraction but also maintain a legible reference. Byreinterpreting various types of visual information, from images to actualphysical objects, he suggests a seemingly reductive situation whereexpectations of formal balance and aesthetics are contradicted. John Monn movedto California from Virginia where he received a BFA from James Madison University inVirginia in 2004. His paintings exist between atmosphere and surface. In his new body ofwork plastic ammunition is aggressively thrown onto the canvas to formshot-pattern abstractions frozen in time. Each panel has its own uniquepatterns and characteristics enclosed within epoxy. Ruth Pastine originally from New York now lives inOjai, where she continues to explore and evolve the concept of Minimalisttheory. Pastine received a MFA from Hunter College, University of New York in1993. Through her work,color and light are reduced to their most elemental form; thousands of tinybrush strokes appear visually seamless, producing an image that is bothobjective and dematerialized. Challenging our preconceptions, Pastine exploresthe subtle character of color. Pastine’smanipulation of color, light and matter questions the visual experience andredefines the perceptual field. Yong Sin, born in Korea, now resides in SanPedro. She received her BFA from Otis College of Art and Design in 1995. Sin’s creates minimalpattern based works that displays a process that is linear and transparent.The works are visually recognizable but contain a shifting and unpredictableperspective. The simple becomes unexpectedly elaborate; the ordinarymetamorphose into distinctiveness. The goal is to create work that isinherently distinctive and belies its repetitiveness. Carolee Toonis a southern California based artist and received an MFA from Art Center College ofDesign in Pasadena, California in 1987. Toon is well knownfor her color field paintings in which she challenges the tradition by creatingworld that are both painting and sculpture. Richard Wilson is a northern California based artist andreceived his MFA from San Jose State University and has exhibited wide in bothnorthern and southern California. Wilson’s work isinformed by a kind of equilibrium between what he see as “human nature” and“landscape nature.” Therefore he uses rectilinear/ architectural formcombined with light, color and atmospheric effects. His paintings are inspired by the surroundings in NorthernCalifornia, by strong memories of my grandparents’ flower farm, the climate andcolor of the Santa Cruz coastline where he grew up, by the evocative qualitiesof music, particularly the rhythms of jazz, and most recently the reminiscencesof childhood trips on Route 66. Wilson’s relief paintings were developed to focus clearly onmeasurements and the visual effects created by area, amount, degree, length,depth, width, size and number. He wants each panel to be beautiful, notonly in relation to it’s place in the linear contour, but also in itself. The painted edges and the change of planes employed in the work renders theviewing all at once impossible, which allows the paintings to unfold in timeand space like music in the landscape. Gary Zymanski is a Los Angeles based artist whose playful abstractions are at oncemischievous and challenging, Szymanski’s colorful grids are visual feasts thatprovide the viewer with surprising thrills. His palette often references pop colors, which he combines inunconventional threesomes that play with the eye. There is an undertone ofhumor in these works that differentiates them from the some approach to mosthardedge painting. Edge to Air is abroad-based exhibition that explores color field painting and hard edgepainting and how these different movements in painting intersect and overlap. It also searches how these artists expand the notion of whatthese two realms are by means of various conceptual and visual interpretations.